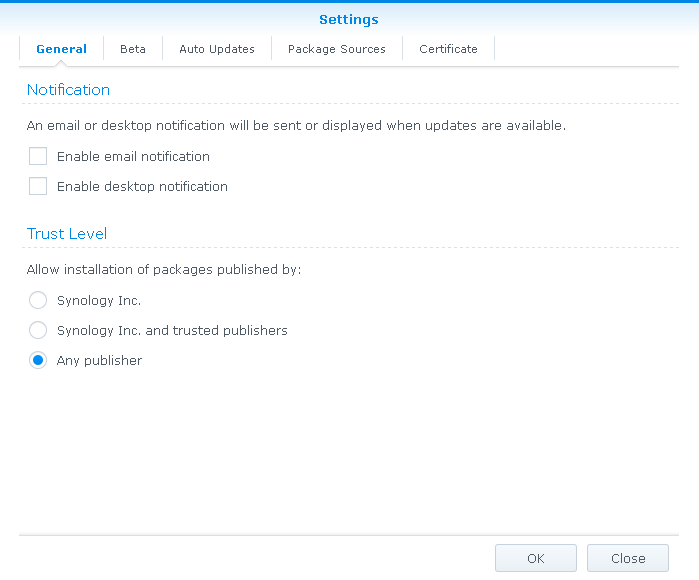 The following are some Frequently Asked Questions on AhsayOBM installation on Synology NAS devices. Which Synology NAS models are supported by AhsayOBM? What are the minimum and recommended hardware requirement for the Synology NAS device? Which versions of DiskStation Manager (DSM) are supported? Do I need to install Java before installing AhsayOBM? 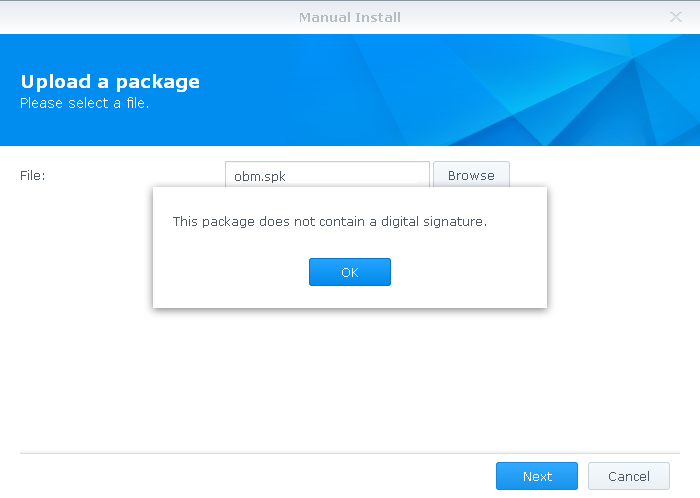 I get the error "this package does not contain a digital signature" when trying to install AhsayOBM on a Synology NAS, why? Where is the AhsayOBM installation directory on Synology NAS? What types of file can be backup by AhsayOBM installation on Synology NAS? Which backup destinations are supported by AhsayOBM installation on Synology NAS? What is the compression type used for backup set of AhsayOBM installation on Synology NAS? What is the default encryption setting for backup set of AhsayOBM installation on Synology NAS? Where is the encryption setting of backup sets saved at? Scheduled backup jobs are not running for AhsayOBM installation on Synology NAS, why? What happens if I close the AhsayOBM user interface while a backup job is still running? How do I stop a scheduled backup job that is running on Synology NAS? For Synology NAS with other applications installed, will they affect the operation of AhsayOBM? Backup job performed by AhsayOBM installation on Synology NAS is slower when compared with installation on other OS platforms? How to modify the Java heap size setting for AhsayOBM on Synology NAS? Advanced backup settings are not found in the AhsayOBM user interface on Synology NAS? For Synology NAS with Intel processor, there is no need to manually install Java before installing AhsayOBM. 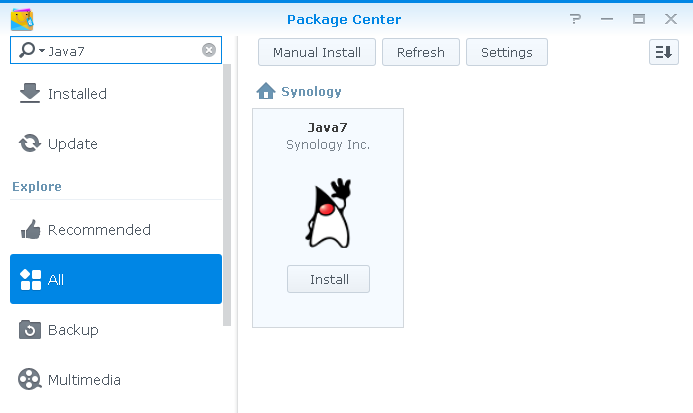 For Synology NAS with non-Intel processor, Java must be manually installed or upgraded before installing AhsayOBM. For device with Java already installed, OpenJDK may be installed instead of Oracle JDK, which may cause instability to AhsayOBM. 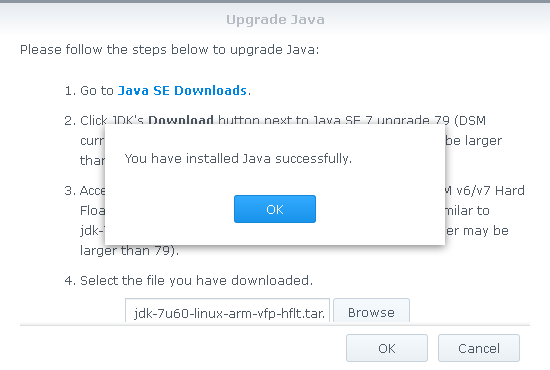 Please upgrade the Java package to ensure Oracle JDK is installed, before installing AhsayOBM. 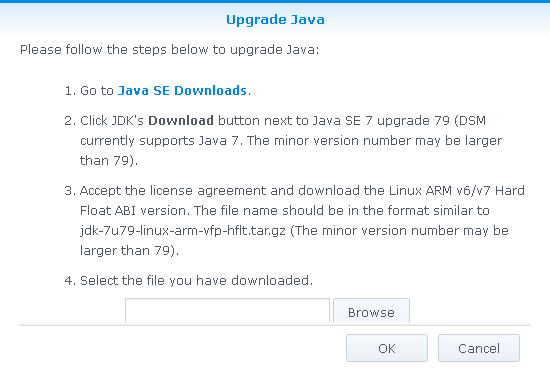 Important: Do not install Java8, only Java7 is supported. 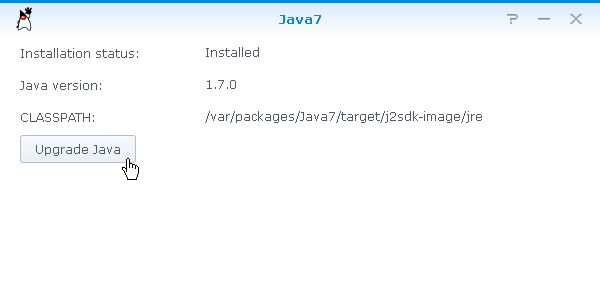 Click Install to install the Java 7 package. Answer) The message is displayed because the AhsayOBM package file is not signed by a trusted CA. Modify the Trust Level of the corresponding Synology NAS to workaround this. In Package Center, select the Utilities tab on the left panel, then select Settings. Answer) Only folders or files displayed under File Station can be backup by AhsayOBM installation on a Synology NAS. Answer) Similar to AhsayOBM installation on other operating system platforms, the backup destination can be set to a supported cloud storage provider setup by the backup user, a supported cloud storage provider setup by the backup server administrator, a user home on the backup server, a FTP or SFTP server, a network volume, or a local / removable volume on the client computer. Answer) By default, compression type 'No Compression' is used for backup set created by AhsayOBM installation on Synology NAS. Note that the compression setting can only be configured via the AhsayCBS console. FAQ: Best practices for managing encryption key on AhsayOBM or AhsayACB version 7? 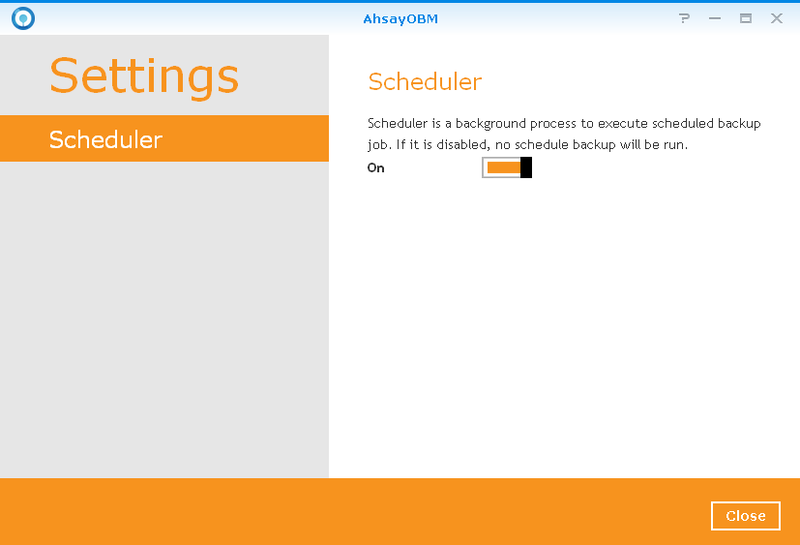 Answer) The backup job will continue in the background even with the AhsayOBM user interface is closed. When you login to AhsayOBM again, the backup progress screen will be displayed. Connect to the Synology NAS via SSH. Where %backupset_id% is the backup set ID of the corresponding backup set. Answer) From our test results, there is no performance issue with AhsayOBM installation on Synology NAS device with other applications installed, as long as the minimum hardware requirements are met by the Synology NAS. Answer) Backup job performed by AhsayOBM on a Synology NAS is slower, because there are less resources available (e.g. in comparison with AhsayOBM installation on a desktop or server grade computer). Typically on most NAS devices, there are less memory and CPU processing power available for the compression, encryption and delta generation processes during a backup. The default Java heap size setting for AhsayOBM on Synology NAS is also only set to 256 MB. User can increase the Java heap size setting to improve the backup performance, refer to the next Q & A for instruction on how to modify the Java heap size setting. JAVA_OPTS="-Xrs -Xms64m -Xmx 256m -Dsun.nio.PageAlignDirectMemory=true"
JAVA_OPTS="-Xrs -Xms64m -Xmx 512m -Dsun.nio.PageAlignDirectMemory=true"
Save and exit from the text editor. Advanced backup settings (Backup Filter, Continuous Backup, In-file Delta, Retention Policy, Command Line Tool, Reminder, and Bandwidth Control) are not found in the AhsayOBM user interface on Synology NAS? Backup Filter cannot be created for AhsayOBM installation on Synology NAS. Continuous Backup is only supported for AhsayOBM installation on Windows platforms. 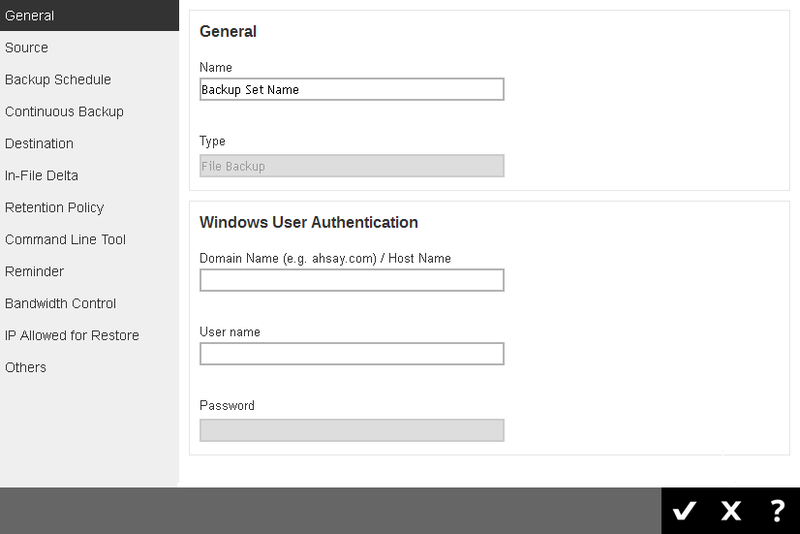 Can be configured in the AhsayOBM user interface, at Backup Sets > Select the corresponding backup set > Others > Retention Policy.